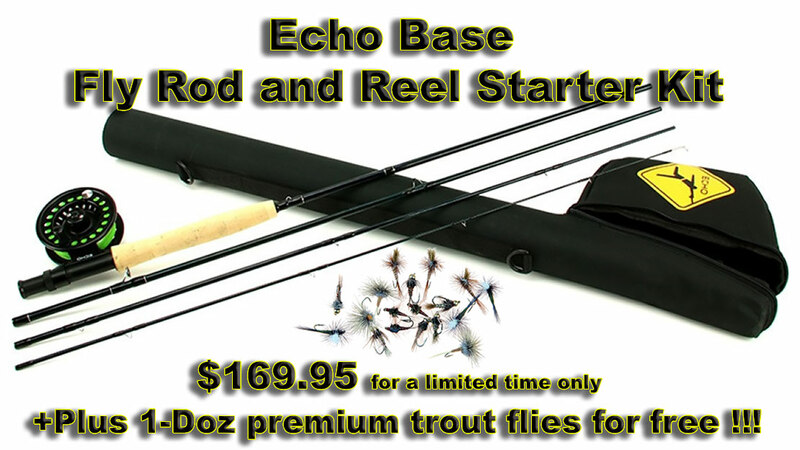 Echo Base Kit Excellent entry level fly fishing combo kit! Tim Rajeff personally selected the Echo Base Kits for entry-level anglers or those who can't help but keep a setup stowed behind the truck seat. Includes a proven, four-piece performance rod, durable reel and a great line with a mono tapered leader. This kit is plug-and-play, and even includes a protective case.This Kit has everything you need to get started! Plus 1-dozen premium trout flies in a reusable transparent, snap-lid plastic fly box. Feels great in hand, but right now snow and ice on the water. But first impression is very smooth reel & nice action on the rod. For the money spent think this is a great deal. More later when I get to fish again. Also had a little hiccup in delivery and taken care of nicely by Tony. So GREAT customer service.